This week Snapchat is rolling out Shoppable AR, a new feature that makes it even easier for advertisers to sell goods through sponsored lenses. 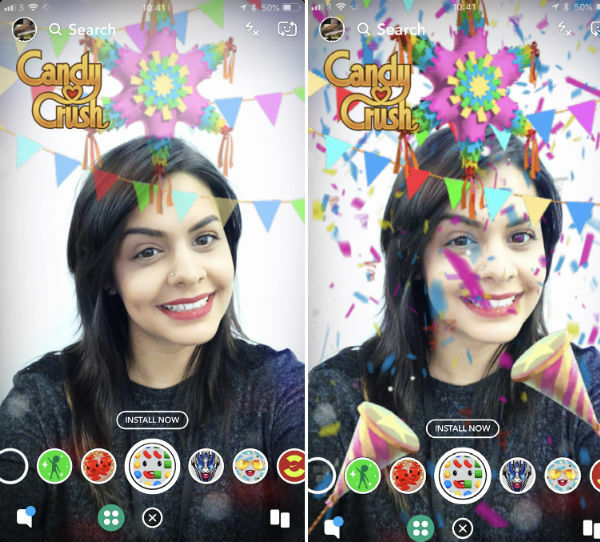 The new offering builds on top of the Sponsored Lenses the service rolled out in late-2015, which let advertisers create branded filters, bringing product placements to selfies. Now companies can essentially close that shopping loop, while keeping users inside the Snapchat experience. Shoppable AR makes it possible to add a button directly to a Lens, which users can tap on to visit a website where they can learn more about or — more to the point — just buy the product. Other options include a link to install an app or a “long form” video like a trailer. All of that happens directly inside the app. The feature is rolling out with a quartet of media partners to start. Clairol is selling an AR “beauty product trial,” Adidas is moving its Deerupt running shoes, King has an AR Candy Crush game and STX will try to get you to watch Amy Schumer’s new comedy, I Feel Pretty. There’s no price increase here for advertisers. The additional features will no doubt be an easy sell for those companies that have already been using Snapchat to advertise. Keeping users inside the app reduces friction of sales quite a bit, offering up ads and product sales as a more organic feature — one that doesn’t necessarily feel like advertising. For Snap, of course, the more time users spend engaged directly inside the app, the better. According to Snap, 70 million users engage with Lenses each day. Earlier this week, the company also rolled out updates to Lens studio, which lets users create their own AR Lenses for the platform.